Dr Robin L. Zebrowski, Associate Professor of Cognitive Science and the Chair of Cognitive Science Program at Beloit College, WI, USA invited by Associate Professor of General Psychology Kristjan Kask at the School of Natural Sciences and Health,TLU. 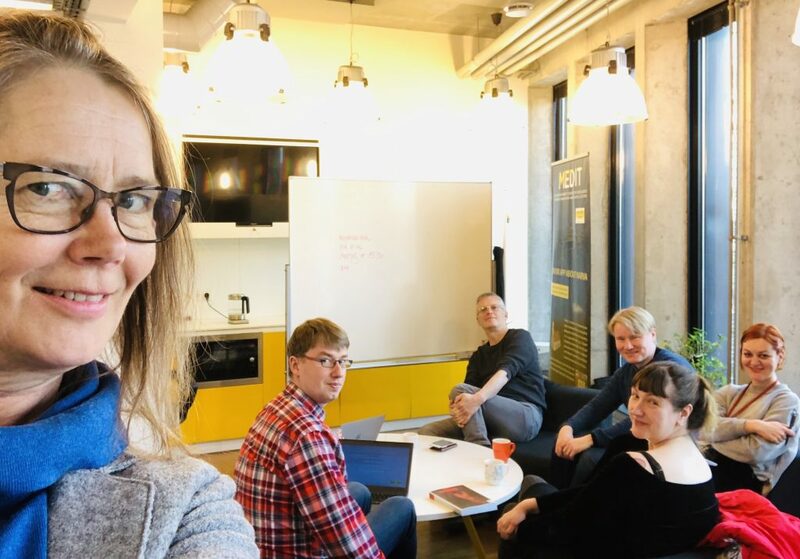 An intellectual aftermath inspired by Robin’s talk at the MEDIT’s meeting space, BFM, (from right) PhD student Jelena Rosic, professor Robin Zebrowski, senior researcher Ilkka Kosunen, associated senior researcher Mauri Kaipainen, professor Kristjan Kask and professor Pia Tikka. What does it mean to be present somewhere? In this talk, I’ll explore this question by looking at telepresence technologies and ways of extending our reach across wide distances, while also critically examining what we mean by “the body” that gets extended. We’ll look at what phenomenologists have called “intercorporeality” – the felt experience of being present with other beings like us, and we’ll look at how this interacts with our experience of telepresence technologies, including virtual reality, telerobotics, and EEG-type prosthetics. Robin L. Zebrowski is an Associate Professor of Cognitive Science in Beloit College, Wisconsin (USA). She has a PhD in philosophy from University of Oregon. Prof. Zebrowski is interested in her research in embodiment, artificial intelligence and other emerging technologies. Prof. Zebrowski is coming to Tallinn University as a Fulbright Specialist Scholar. 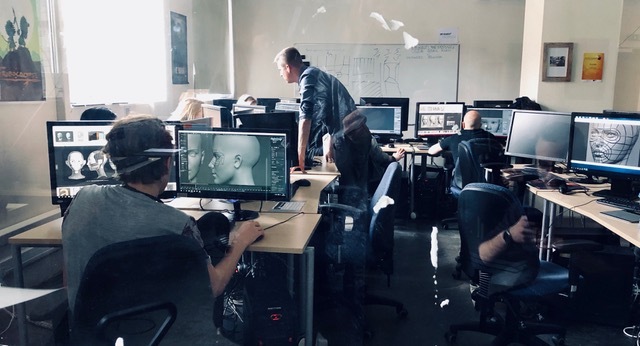 With a group of students from Department of Digital Learning Games, guided by professor Martin Sillaots we visited Tartu Art School (Aparaadi tehas – Kastani 42) In the image one of the teachers, 3D artist and CGI generalist Erich Brutus presents the highlights of the animation program at the School. 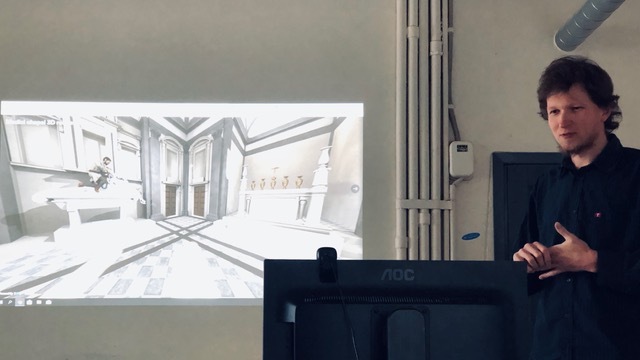 Department of Digital Learning Games, professor Martin Sillaots organised a visit hosted by Professor Anneli Kolk (image) and her team at the Department of Paediatrics at the Tartu University Hospital. Among other things they focus on developing the social perception and cognitive abilities of children with neurological damage, using touch screen and VR technologies.